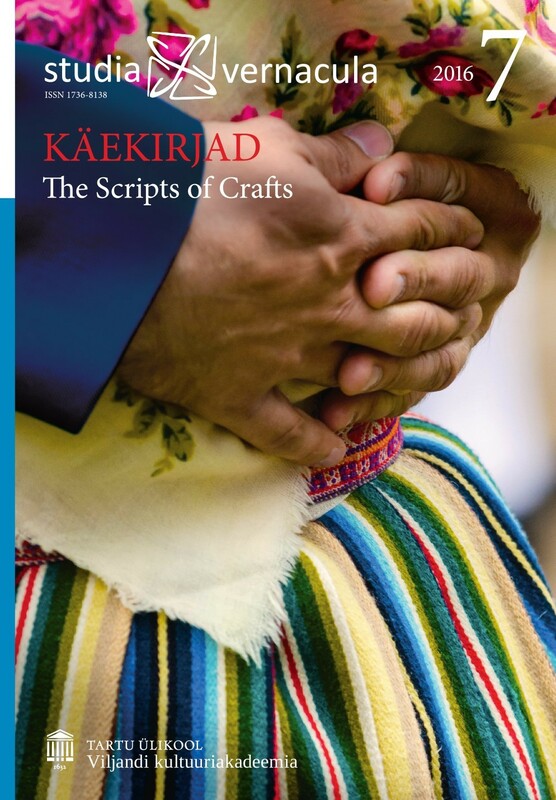 The book “Estonian National Costumes” by Melanie Kaarma and Aino Voolmaa, published in 1981, describes the bridal clothing of Kuusalu parish. The set is dated as originating from the late 18th century. It includes a headscarf that is placed on the head of the bride or fiancée in the course of the bridal ritual (where a piece of married woman’s headwear is placed on the head of the bride, thus symbolising her becoming a married woman). The measurements of the headscarf are 42x190 cm, and both ends of the piece of cloth are decorated with embroidery, hemstitching and bobbin lace. The book also includes precise instructions on how to place the headscarf on the wearer’s head: it has to be folded lengthwise in the middle and placed on the head in the shape of a cone in such a manner that the middle of the headscarf is above the forehead and the ends flow over the shoulders towards the back. The ends of the headscarf have to be fixed with a brooch above the neck at the back. The method of attachment of the headscarf reconstructed by authors is based on a photo dating back to 1906 (see photo 5 and figure 1) that shows a Kuusalu woman wearing one of the headscarves in question. The author of this article visited the National Museum of Finland in early 2015 to study the object on which Voolmaa and Kaarma’s reconstruction of the Kuusalu bride’s headscarf is based. The main discovery made was that the preserved object is decorated with embroidery and lace only at one end of the headscarf; also, some minor changes were detected in the pattern of the embroidery. The information gathered raised doubts as to the way the headscarf had been worn as far as was known – i.e., with both decorated ends visible. Different sources provide information about possibilities to attach the kerchief with a hairband, the hair itself or a hairpin. But all of the sources refer to a headscarf decorated at both ends. A breakthrough was achieved when the notes of the person who donated the object to the National Museum of Finland were discovered. It turned out that the object in question was not, in fact, a bride’s or fiancée’s headscarf but instead an object used during the capping ritual. This ritual was performed by one particular woman in the village, who was also the owner of the headscarf. Focussing on the knowledge that in Kuusalu the headscarf used was a piece of cloth decorated at both ends, the author experimented with different tying methods in order to identify the closest possible method to the one used in the photo. At the same time, it was important to fix the headscarf securely on the head and for the scarf to be practical. The information gathered is not conclusive, but is extremely useful in adding to the knowledge about the bride’s headscarf used in Kuusalu.